Recently I mentioned how Monarch butterflies have declined as a species this year. Ecologists across the country are encouraging home owners, gardeners, landscape designers and proprietors of public spaces to plant more Milkweed. Milkweed, the native plant family Asclepias, is the Monarch caterpillar’s host plant. When we integrate it into our gardens, as I was able to in a butterfly garden in Queensbury, NY this week, it enables Monarchs to complete their lifecycle and encourages the continuation of their species. 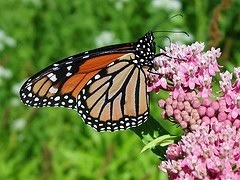 In other words we create Monarch habitat by simply planting Milkweed. 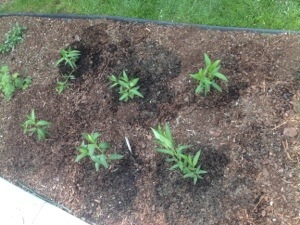 A. Incarnata, aka Swamp Milkweed or Pink Milkweedwas the species we chose for this Queensbury garden; A. Tuberosa is another fine choice of habitat garden Milkweeds- A. Tuberosa can’t tolerate standing water the way Swamp Milkweed can.